It’s a colder-than-usual April morning, and I have been up since 4:47 a.m., reading and writing, thinking and learning, meditating and relaxing. It’s a ritual of mine that I have practiced for nearly 30 years, and it has made all the difference in living a full and inspired life. I am a self-described early-morning person. I know that my greatest productivity happens as the sun is rising, and knowing this has allowed me to structure my entire lifestyle around my hours of highest energy and focus. It’s not for everybody, this early-morning routine. There’s just something about making those accomplishments so early in the day that makes me feel better about everything else I might be doing later. It ignites my creativity and my confidence in everything else I do. In other words, it helps me make every moment matter. Here I am, crossing the finishing line of the Baltimore Half-Marathon in October 2012. I do a lot, and I enjoy everything I do, simply because I choose to do it. Last April, I realized that my weight was becoming an issue, especially in getting older. 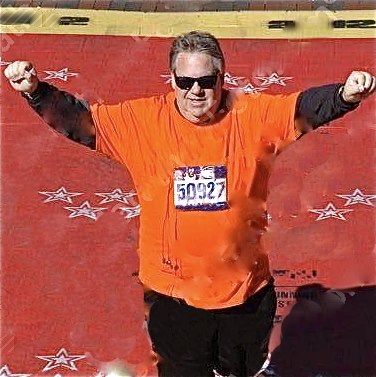 I made the decision to lose weight and participate in the Baltimore Half-Marathon. Through hard work, careful management of my time, and keeping my focus on my goal, I was successful. I have experienced very few moments of pride and accomplishment that rival crossing that finish line in October. That was six months ago, though. Since that time, I have shifted my focus to other things that I enjoy (with a continued emphasis on writing and working with building stronger communities). As a result, my health has suffered, and I find myself a year later in April readjusting my time and my priorities. In just a couple of years I will be 50, and what I have realized in this past year is that, to be impeccable with your time, you need to be diligent in how you use every moment. For me, I cannot allow myself to lose that focus for a single moment, for any reason. If I do, I know I will succumb to rationalizations that somehow justify my failures. I need to be vigilant, every moment of every day, to stay the course and reach my goals. One of the reasons why I am writing this post is because, recently, I’ve made some decisions to shift my focus so that my energy and productivity will help a larger number of people, while allowing me to reach some new wellness and financial goals. This requires me to think about more aspects of how I spend my time, including taking better care of myself. My first instinct is to find role models who are already doing this with their own lives. There are many famous examples for us all to follow, but they are so… inaccessible when it comes to chatting with them about the inner workings of really being impeccable with time. So I looked locally for that “perfect” role model, and I thought immediately of a former student of mine, Sam Hawkins. Sam was crowned Miss Appalachia 2013 in January. When I taught Sam a few years ago, she was our newspaper’s photo editor, an organized, focused, and likeable individual who always finished what she started. She took incredible risks with her photography, entering — and winning — local and regional contests. She needed no motivation or inspiration; she tapped into the energy within her to determine what she wanted, how to achieve it, and then succeed in reaching her goal. Not so long ago, Sam decided to enter the world of pageantry, and like her ambition and drive in high school, she applied her will and determination to succeed in this arena. She was recently crowned Miss Appalachia 2013, and she is working hard at becoming Miss Maryland this June. What does Sam do? A lot. She is currently taking five college classes with a 3.95 cummulative college GPA. She is a Humanities Scholar at UMBC and a member of the UMBC Honors College. She studies piano once a week at Peabody, volunteers with the St. Francis Neighborhood Center, and organizes fundraisers for the Children’s Miracle Network Hospitals. She just received an Undergraduate Research Award to write a book on Baltimore (tentative publication is early 2014). She trains at the gym, works out with a personal trainer, maintains a strict diet/nutrition plan, and frequently attends other appearances related to Miss MD. As if that is not enough, she has an active social life and a boyfriend. I asked Sam, directly, what the secret was to her success. Like everything else with Sam, she was direct. Let me first say that I’m no expert and this is something that I’m continuing to improve upon. But, the way I see it, everyone has the same amount of time in every day. You and I have the same 24 hours per day that Albert Einstein, Martin Luther King, Mahatma Ghandi, and Bill Gates had. Look at how much they accomplished! It’s not an issue of having the time, it’s an issue of making the most of the time that you have. This is where priorities come into play. I think the key to be high-achieving is to make a list of 5 priorities. For me, they go: 1. Health (physical, emotional, sleep, and essential relaxation), 2. Academics, 3. Friends, 4. Miss Maryland, 5. Work and other activities. When it comes down to what I need to do in the day, I take care of things according to the priority list. For example, the first thing I do is make sure I have all my meals packed and ready for the day and make sure that I’m well rested. If you aren’t eating well or haven’t gotten enough sleep, you won’t be good at doing anything else. Next up is academic stuff– I try to sit down and do whatever homework is due for the next few days an hour or two every day. This is done a lot of the time when I wait for the bus, am eating lunch, or whenever I designate time throughout the day. Friends and family are important too! I make time every few days for an evening where I don’t do anything but hang out. It helps you retain your sanity! Miss Maryland stuff I schedule in advance and then work my schedule around. It gives you a way to map things out, make to-do lists, etc. Planning and preparation are truly the key for success. Figure out what you need to do and start knocking things out! Conquer your highest priorities first. If you’re just starting out with trying to increase your productivity I would suggest trying to keep a log of what you are doing on a daily basis and then looking back at it. Are you spending 3 hours every day on Facebook? Are you watching television instead of doing homework? Are you putting off work until the last minute? Chances are, you have the time available– you just don’t realize it. The next step would be to make goals. I try to make 3 week, 3 month, and 3 year goals. WRITE THEM DOWN! Make goals, make a plan, put it into action. Rework your time to fit your goals. Instead of spending 3 hours watching television or playing on the computer, use 2 of those hours to make progress toward your goals. Set time aside in advance and hold yourself accountable! If you want to get to the gym more, make it as important to you as a job interview would be. Set a time and then get to it! Always remember your priorities and that will help you stay focused. Being super productive is not easy– if it was, everyone would be! But it’s totally possible and 100% worth it. You only have one life so make the most of it! Accomplish everything that you want to and never have what if’s. I promise that you’ll remember the moments where you worked hard to achieve a goal over the moments where you wasted time away staring at a screen. Make a point to go to bed every day satisfied and with the knowledge that you’ve accomplished something. Make steps to be the person that you admire and soon enough you will be that person. Good things don’t come to those who wait for them, they come to those who work hard and put in the time to get them. Sam Hawkins, participating in Read Across America Day. For more information about Sam and her volunteer work (as well as her journey to the Miss Maryland Pageant in June), you can follow her on her website and on Facebook. Great article Rus! I need these lessons for my own time management! Thanks, Bernadette– Sam is right; it does take a lot of hard work and focus, and if you are not diligent enough, it’s so easy to slack off and let the world pass you by. When I was running the half-marathon, I decided to take a pit-stop at one of the portable restrooms as a nice “break” at around mile 5. Biggest mistake I could have ever made. It wasn’t a necessary stop, and when I resumed running, all I could think about were the hundreds of people who had passed me in those 3 minutes. Every moment counts, of every single day. We must constantly ask ourselves: Is this the best possible way to spend my time? Is this contributing to my goals in life? Is this providing balance and energy? Sam stresses the need to spend time with friends and be social; this is NOT slacking at all… This is contributing to that balance. Everything should be done with intent. Everything.